Products provided by The Embroidery Coach to help you in your Embroidery Business! Learning is an everyday process and you will move further a lot quicker if you will dedicate some time each week towards learning all that you can about the embroidery business. 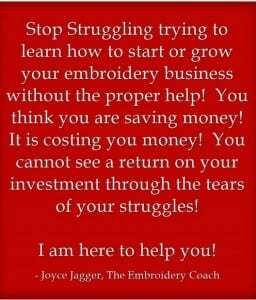 This is for the brand new embroiderer or the person that wants to start an embroidery business. Inside of this program you will learn how to Plan your Embroidery Business, Price your Embroidery, Marketing your Embroidery, Create a Working Business Plan and even learn some important Design Techniques. You also receive all of the Business Forms that you will need along with Order and Production Processes! This is a course that focuses on your work flow and accounting set up! You will learn how to set up QuickBooks for the apparel decorating business. Setting up QuickBooks for the embroidery business is totally different than it is for any other type of business and this is extremely important that you have your accounting system set up correctly for an efficient work flow and be able to track your profitability! This course will also include all of your Business Forms and Order Processing! With my very comprehensive on-line Video-Based Embroidery Training Program, I teach you quick tips and proven Embroidery Techniques to help you get started immediately in your embroidery business. These videos are available to help you with whatever issue you are facing, 24 hours a day, 7 days a week! Which Ever Level You Are In Your Business, Inside Of The Embroidery Training Resource Center, We Have The Information And Systems To Help You Get To The Next Level With Easy To Understand, Step By Step Instructions In Embroidery Basics, Embroidery Techniques, Embroidery Design Techniques, and Business Strategies! This is a 9 week coaching program, 9 Steps To A Profitable Embroidery Business‚ that is going to help you take the struggle out of your business, get you more organized and set up systems to become more profitable. This On Line program will walk you through step by step how to create your own pricing structure. You will be ready to create a price list for any type of pricing situation you have in your business. This program includes many downloadable formulated worksheets that are interactive. “If you want to stay in front of your current customers, gain new customers and increase your bottom line, this is a must for you! Inside of this program you are going to be able to learn all about marketing your Decorating Apparel & Embroidery Business, creating a full marketing system that will work for you 24 hours a day even when you are sleeping once you have it all set up! This is a simple step by step program that you will be working through one level at a time. In this On line program I teach you how to create many large and small monograms using your normal embroidery fonts and some true type fonts. I show you how you can create an entire set of monograms from Wash Cloth size to Shower Curtain size. I also include a free font that I created for you that will work for small monograms and large ones. In this on line program I show you step by step how to create beautiful small lettering that will sew out great on any type of fabrics. You will learn all of the secrets of creating small lettering. I have many tips and tricks that I share in this training. This is a must have for your embroidery training library. This is the type of video that you will pull out every time you create small lettering. You will soon be a master of this very tricky type of embroidery. In this on-line program I teach you the Simple Step by Step Process for Creating Puff Embroidery that sews out great every single time! This simple step by step method can be used to create any type of shape or letter that your customer is wanting for their custom puff embroidery designs. You can start out by promoting a simple 2 inch Full Block letter on the front of caps that I give you, free of charge for purchasing this program!